POP! 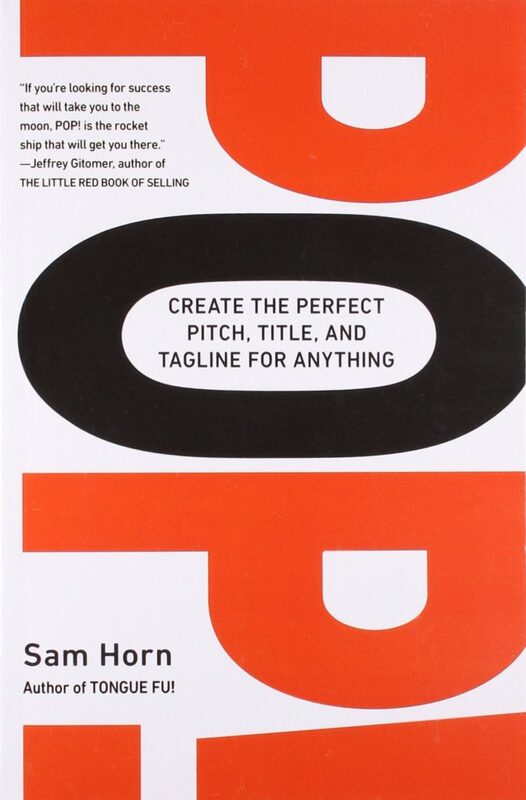 by Sam Horn (Perigree, 2009) offers an easy-to-follow road map on how you can sell your idea or brand in 60 seconds or less. The basic idea of POP! is that by completing a series of mental exercises you will be able to better market your idea in a way that will “pop” out in comparison with your competitors. Sam Horn, who bills herself as the Intrigue Expert, is a messaging and branding specialist, public speaker and author of many top-selling books related to marketing and business. Horn’s other books include Tongue Fu!, Got Your Attention? and What’s Holding You Back? So, what is POP!, anyway? In the Introduction author Sam Horn describes the evolution of the concept. She developed the idea initially as a way to help fellow authors create 60-second pitches for their books in order to help sell to publishers. The authors had done all the hard work, but they consistently were unable to articulate their pitch when it was needed the most. By expanding on her 60-second pitch concept, she developed a technique she called POP!, which I’ve paraphrased below. P – stands for “Purposeful”. Your pitch needs to be on point and clear. If it’s not clear what you’re selling, your pitch will fall flat. O – stands for “Original”. If your product is just one in a crowded feel, you need to differentiate it. P – stands for “Pithy”. Create your pitches to be short and to the point, but memorable. After defining POP! Sam Horn goes to discuss a series of nine questions she refers to as a W9 form. At this point she asks the reader to get directly involved and to fill out the questions as they pertain to what they personally would like to accomplish. The beauty of this approach is that these core concepts are transferable to really any project you want to accomplish in your life. You can use these techniques to develop a brand slogan, to create a sales pitch for your product, to design a print ad or even to figure out how to sell yourself on your next job interview. Horn asks you to fill out your W9 form and to keep it handy so that you can refer to it while reading the book. For those reading the book I highly recommend completing your W9 form as it really puts the entire book into perspective. Without completing the form, the book is just another self-help book of sorts, casual reading to toss aside once you’re finished. By forcing yourself to complete the list of questions, which will probably take you at least 15 minutes or more, you are committing yourself to actually making an improvement toward your idea or concept. In my case, I chose to use the W9 to brainstorm ways to improve the reach of my website SEATravelZombie (now #ErikTomrenWrites). In fact, simply filling out the form gave me a lot of insight into what I wanted to accomplish as a writer and also the results that I want in order to consider my website a success. After filling out the W9 form I felt much closer to figuring out a path to success for my website and my writing. The remainder of the book introduces a variety of concepts, each one which may be useful for your particular project. As mentioned in Horn’s introduction, the point is not that every technique in the book will provide you with simple answers, and some techniques you may not want to use at all. But each chapter provides you with another tool to consider. For example, section 5 of the ‘Be ORIGINAL’ chapter is entitled ‘Create Tell ‘n Sell Introductions with the Valley Girl Technique.’ Horn recalls a time when a hotel concierge offered a restaurant recommendation that would fit well with her two teenage sons. The concierge described the popular sports bar chain Dave & Buster’s as “it’s like.. Chuck E. Cheese’s for adults.” The concierge could have simply described Dave & Buster’s as a sports bar. Instead, he chose to reference a beloved childhood institution that any family would be familiar with, simply adding “for adults” into the description. Every chapter of POP! by Sam Horn is loaded with real-world examples of companies who have succeeded by carefully crafting their brand messaging and marketing efforts. Some examples will be instantly recognizable to students of marketing and mass media, such as the Aflac duck television ads or that of GEICO. In both of these examples – found in section 8 of the ‘Be ORIGINAL’ chapter ‘Aflac Your Topic So They See What You’re Saying’ – the companies modified their brand message so that seemingly meaningless acronyms could now be associated with animals (a duck in Alfac’s case, a gecko in GEICO’s case). But were you aware that when you input an ‘In Case of Emergency’ number into your cellphone – a so-called ICE number – that the idea was invented by one person, Bob Brotchie, a Cambridge-based paramedic who witnessed a major problem of missing emergency contact information during the July 2005 London bombings and offered a simple solution. Brotchie used similar techniques as those outlined in POP! to help solve a major problem facing emergency workers, a credit to original thinking on his part. Other sections of POP! by Sam Horn delve into substantive discussions about alliteration, cadence, inflection, juxtaposition and rhythm and their importance in crafting a brand message. An example of alliteration used to great effect would be the brand names Best Buy, Bed, Bath and Beyond and Dunkin’ Donuts. But one example that most people may not have thought about is the infamous closing line of defense lawyer Johnnie Cochran during the O.J. Simpson murder trial. Cochran’s final closing statement, which some would argue may have won the case with its simplicity, was “If it doesn’t fit, you must acquit,” referring of course to the glove found at the crime scene. This real-world example is just one of many goldmines of inspiration found in POP! As a reader you realize that these techniques apply to everything in our daily lives; they are not abstract concepts used solely by marketers. The techniques described in POP! by Sam Horn will help you communicate your thoughts, feelings and motivations in any situation. As such, the book offers invaluable advice on how to make your writing, your proposal, your biography “pop.” By following the exercises found in this book you will be on the path to success, regardless of what your goal is. I highly recommend POP! by Sam Horn for any marketers, writers or public speakers, but the information contained here is really for everyone. In fact, the book’s biggest selling point is it’s fresh, engaging content. This is an inspired page-turner full of real-world examples that will leave you ready to take on any creative challenge.